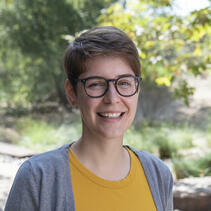 Sarah Ford serves San Diego Global as a Research Associate in Conservation Genetics. As part of the northern white rhino project, she is assisting our efforts to produce induced pluripotent stem cells (iPSCs) from the rhino skin cells (fibroblasts) currently cryopreserved in the Frozen Zoo®. Sarah’s research interests include the development of a northern white rhino transcriptome library, derivation of iPSCs from somatic cells, and differentiation of iPSCs into various cell types, including gametes. Sarah’s main focus is identifying gene network pathways in northern white rhino stem cells and other cell types. She will also use a variety of molecular and cytogenetic techniques to optimize the transition of fibroblast cells to functional northern white rhino gametes. Sarah earned her bachelor’s degree in Biology from Indiana State University, where she spent most of her years as a Pre-Med student before discovering that her true passions were in the field of conservation genetics. She went on to manage the Core Genome Facility for The Center for Genomic Advocacy at Indiana State University, where she sequenced a variety of whole genomes and transcriptomes for collaborators of the Center. During her time at the Center, she also used molecular genetic techniques including paternity analysis and sexing of the white-throated sparrow. Sarah was motivated to seek a career with San Diego Zoo Global after spending a week at the Institute learning Frozen Zoo ® Cell Culture techniques.